The phrase “All Roads Lead to Rome” connotes the cosmopolitan culture that has long been present in the Eternal City. It’s also the title of a Notre Dame exhibit running through the fall 2011 semester to highlight spectacular acquisitions by the University’s Department of Rare Books and Special Collections in conjunction with the new interdisciplinary Italian Studies at Notre Dame program. 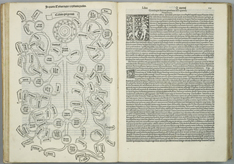 The collection concentrates on the history of Rome as told through the development of cartography, architecture, and travel literature from the 16th century through the modern era. The acquisitions are expected to have a broad appeal to scholars across a number of disciplines. “This topic brings together historians, musicologists, liturgists, theologians, medievalists, architects, and art historians as well as classicists and a variety of scholars of Western literatures—many diverse disciplines and interdisciplinary studies are represented,” says Louis Jordan, head of Special Collections and the Medieval Institute Library. The All Roads Lead to Rome exhibit traces Roman history from ancient times to the early modern era. 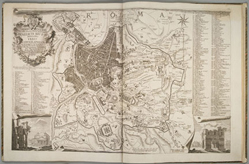 It features city maps that reflect the height of the cartographer’s art from different periods of Rome’s development as well as rare documents and prints that record the building of the city, such as engravings depicting the construction of St. Peter’s Basilica. The exhibit also displays travel guides from the 16th though 19th centuries that document the changing interests of travelers over time. All together in one collection, these books and other artifacts speak to the breadth of art, faith, and history encapsulated within the urban environment of Rome. The University’s Office of the Vice President for Research awarded the Italian Studies at Notre Dame program a library acquisitions grant in January 2010 to expand Hesburgh Libraries’ holdings on diverse aspects of Roman architecture, art and art history, classics, and social and political history. Thanks to additional contributions from individual faculty funds and programs across the University, more than $350,000 was spent on the initiative, which will put Notre Dame even more firmly on the map of Italian scholars around the world, says Jordan. Tracy Bergstrom, librarian for the Zahm Dante Collection and the administrator of the acquisitions grant, is serving as curator for the fall 2011 exhibit. For Bergstrom, the travel guides were also especially appealing. Not only do they depict all the typical concerns of travelers of any time—where to stay and what to see—but the guides from each period also reflect the particular interests and cultural expression of their times and sources. “They’re a tremendous amount of fun,” she says. One such item in the exhibit is a 1511 pilgrims’ guide that highlights all the sites collectors of indulgences might wish to visit to make the most of their visit to the Holy City. Another early guide offers descriptions of Renaissance art as it was being created, including the first printed description of Michelangelo’s decoration of the Sistine Chapel. 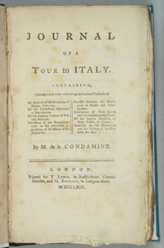 A later guide written for 19th century British Grand Tour travelers reflects the imperial conceits of a visitor from a contemporary empire to an empire of the past. The now expanded Rome collection, says Bergstrom, means that faculty and students at Notre Dame will have more primary research material within their reach. It also suggests at least that a few more roads will lead to Notre Dame as the University continues to build its reputation as one of the premier institutions for the study of Italian language, culture, and history.